A coffin bearing the remains of an unknown soldier is carried to its final resting place Saturday in Fromelles, France. FROMELLES, France (CNN) -- An unknown World War I soldier was buried in Fromelles, France, on Saturday, the first of some 250 bodies recovered from a string of mass graves dating back to a bloody -- and largely pointless -- battle that claimed thousands of lives in a single night. About 2,300 British and Australian troops were killed, and thousands more wounded, captured or left missing in action when they were ordered to charge into German machine guns on July 19, 1916. Nearly a century later, the battle of Fromelles remains the deadliest 24-hour period in Australian military history, the country's minister for veterans affairs, Alan Griffin, said Saturday. "The air was thick with bullets, swishing in a flat, criss-crossed lattice of death. Hundreds were mown down in the flicker of an eyelid," said British veterans minister Kevan Jones at the ceremony, citing survivor W.H. "Jimmy" Downing. So many died that night that the British and Australians were unable to recover all their dead. 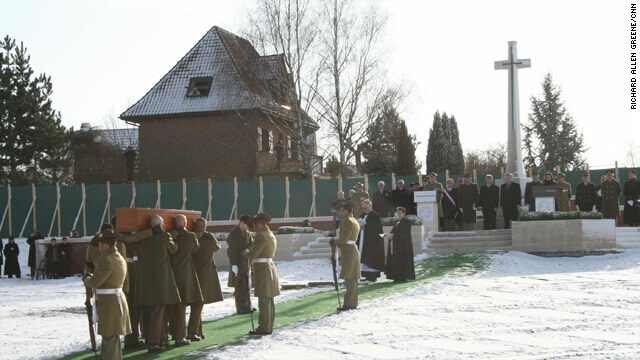 German soldiers buried hundreds in mass graves. The graves were rediscovered only in 2008, and last year the Commonwealth War Graves Commission took the lead on a project to recover and identify as many remains as possible. The Commonwealth is an association of nations that once were part of the British Empire. Excavations began in May 2009 and lasted until September. Meanwhile, a new cemetery, Pheasant Wood, was laid out near the site of the battle in northern France, near the Belgian border. The soldier buried Saturday has not been identified, but DNA samples have been recovered from many of the bodies, often from the teeth, said Peter Jones, the DNA consultant on the project. Some 800 people from Britain and Australia who think they may have a relative buried at Fromelles have provided DNA to try to help identify the bodies, he said. But that's only half as many as the experts need, Jones added, since about 1,600 Commonwealth dead from the battle remain unaccounted for. The 250 bodies being buried at Pheasant Wood are among the 1,600. DNA samples are not the only way to identify bodies, though, said Margaret Cox, the archaeological consultant to the project. About 6,200 personal artifacts were found alongside the bodies, which could help to identify them. In addition to the expected military decorations, uniforms and buttons, Cox said, they include such heartbreaking items as a locket with a lock of hair, and a return ticket to Perth, Australia, left on the body of a soldier who never lived to use it. Most of the remaining bodies will be buried over the next two months, with headstones being added starting in March for any victims who can be identified, the Commonwealth War Graves Commission said. Those whose names cannot be determined will be marked by a headstone reading "Known unto God," the agency said. The final body will be buried on July 19, the 94th anniversary of the battle. Pheasant Wood is the first new cemetery to be built by the Commonwealth War Graves Commission in nearly 50 years, said spokesman Peter Francis, calling the mass graves "the largest military find since the end of the Second World War" in 1945. The commission is a nonprofit organization that commemorates the dead of both world wars from the British Commonwealth. Founded in 1917, it maintains graves and memorials at 23,000 sites around the world.